One of the best ways to nurture a budding interest in birdwatching is to keep a bird checklist. A checklist is simply a list of birds recorded in your area and “keeping a checklist” is using that checklist to keep track of all the birds you have seen. Every birdwatcher eventually starts to keep a life list, which is a “master checklist” of all the different bird species they have seen during their lifetime. An easy way to start this life list is to keep a backyard checklist. Even if you don”t have a true backyard, you can still keep a checklist of the birds around your residence. First, you need to define the limits of your backyard. If it really is a backyard, then you could define it as all the space within the fence lines, or you could include any species you see within, or from, your backyard. 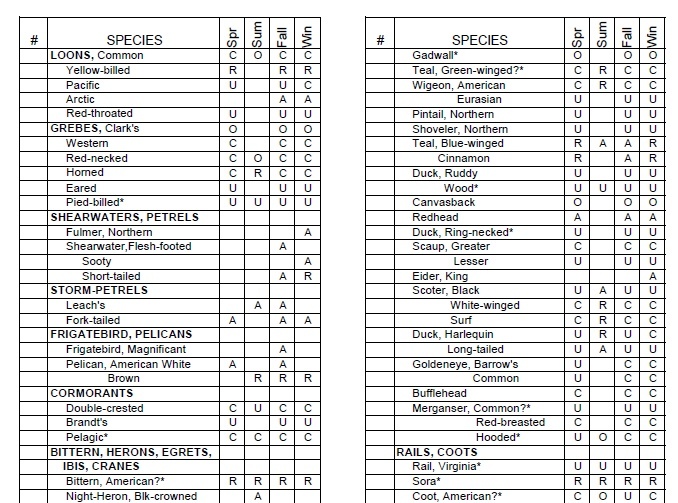 Then contact your local bird club, natural history society or museum about getting a copy of the regional bird checklist. Chances are, you can also download a copy of that checklist off the internet and print it yourself. Find a spot where you can keep the list. A good place is next to a window which overlooks the backyard. Each time you see a new species, mark it on the checklist. There are several good reasons for maintaining a backyard checklist. First, it”s a good introduction to the world of birdwatching. You don”t have to travel to exotic or foreign locations; you can watch birds in your own yard. And you will no doubt be pleasantly surprised at how diverse the bird community can be in your very own backyard. Second, keeping an eye on the birds you see most often is a great way to hone your identification skills. A species that was originally hard for you to identify will become easier to identify the more you see it. And once you have the visual identification of a species committed to memory, you can start to add more identification cues to it, like its song, its flight pattern or the way it moves through the branches. Third, keeping close track of a bird community (which is, after all, exactly what the collection of species in your backyard represents – a distinct community) over the course of the year will teach you how bird diversity and bird behaviour changes over the course of the seasons. In fact, you should keep 12 backyard checklists, one for each season. At the end of a complete year, you will be able to track the seasonal changes in the birds for your region. And by the end of that year, you will undoubtedly find that not only is your backyard checklist just one of many bird checklists you are keeping, but that your bird identification skills grew much faster than you thought possible in just one year.